A timber framed pavilion providing education facilities and wardens accommodation to aid in the management, understanding and enjoyment of Catton Park. The park is listed and located in the North of Norwich and is part of the Catton Hall estate. It was initially set out in the 18th century by Humphrey Repton as one of his first commissions as a landscape gardener. The building is designed to be as energy efficient as possible with wall and roof framework made up from 240mm deep engineered I joists fully filled with recycled cellulose fibre insulation. Security has been a key issue, to minimise the likelihood of vandalism in this isolated public space which is in close proximity to a number of large housing estates. Sliding shutters secure all window and door openings and the timber cladding is treated with fire retardant. 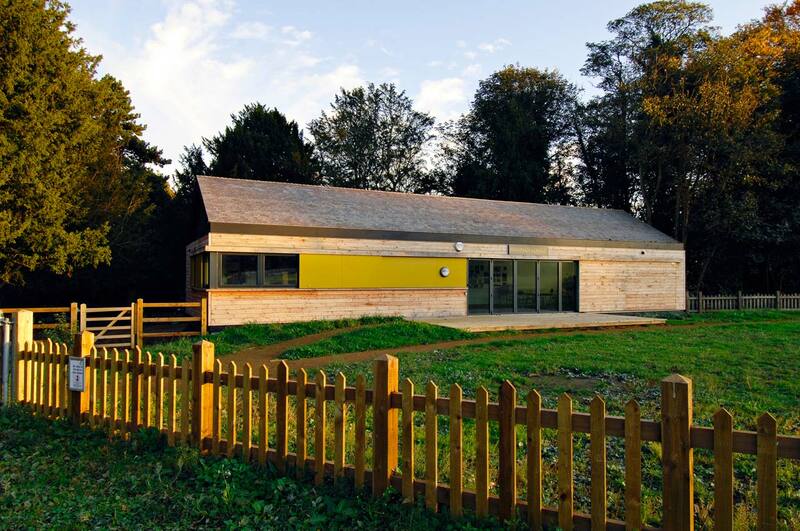 Timber was selected as the dominant cladding material not only because of its sustainable credentials but also to reflect the woodland setting. Gable glazing allows light to permeate through the length of the building creating a light, spacious quality to the main education room. The whole building is supported on piles lifting it clear of the ground in order to minimise disruption to surrounding tree roots. Rainwater is stored below ground and pumped to an external tap for use in irrigating woodland plants.